"Celebrities—they're just like us!" is a phrase you read in magazines that accompanies photos of stars grocery shopping or walking into the gym. While red carpet fashion may not always feel relatable, celebrities really do favour off-duty uniforms much like yours. Case in point? Their cold-weather footwear of choice: cool boots. If you're in the market for a new pair, it's important to find a style that works with both your go-to skinny jeans and leggings. 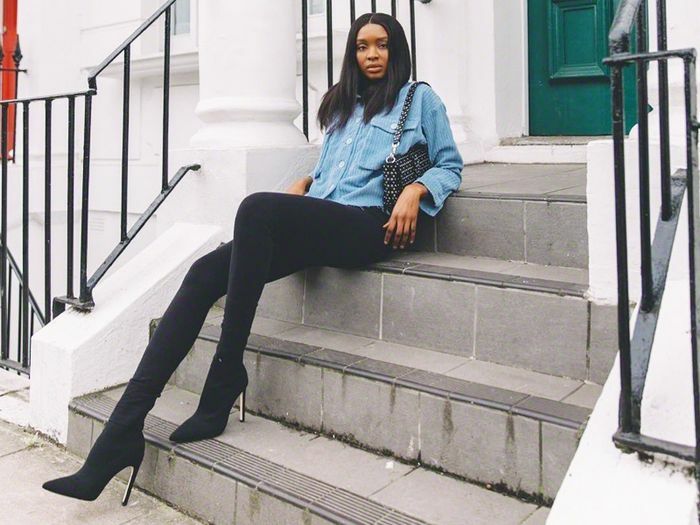 Taking inspiration from style stars and It girls, we rounded up five boot styles that work just as well with denim as they do with your favourite off-duty look. So before you invest in a new pair of boots, see the styles you'll need to get you through the next couple of months. Embrace the cool weather with the four styles of boots below. Try a pair of sleek leather-esque leggings tucked into your favourite ankle boots. Heeled ankle boots paired with dark-wash skinny jeans always look good. Black jeans and over-the-knee boots are a foolproof combination. Leggings and knee-high boots always look good together. Chunky boots look great with a pair of cool leggings. For an off-duty sporty look, layer long socks with boots and leggings. Pointed boots work with every style of denim, but dark-wash skinny jeans are our favourite ones. Consider pairing cropped leggings with boots that allow just a hint of the ankle to show.